A five day trip departing Triabunna for Hobart taking in various parts of South East Tasmania. 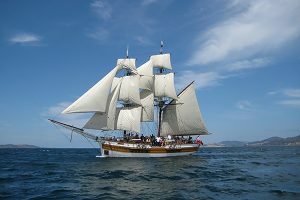 Help sail the ship, climb the rigging or just relax and enjoy the spectacular Tasmanian coastline, scenery and wildlife. We will sail during the day and stop at anchor during the late afternoon for the night. Expected locations include Adventure Bay, Port Arthur, Fortesque Bay, Schouten Island, Freycinet Pennisula, Maria Island. Along the way there will be wildlife galore, seals, dolphins, albatross and other seabirds. We will probably drop a line and see if we can get some fresh seafood, at Maria Island wombats, kangaroos Cape Barren Geese and much more are common. There should be lots of time to get ashore and explore at our various stops. Trips begin 0900 on Monday and finish on Friday afternoon. The Lady Nelson is a 52 foot ‘brig’ (tall ship rigged with square sails on 2 masts) that comfortably sleeps 18 and includes a fully equipped galley, saloon for meals, toilets and hot showers. A replica of the original H.M.S Lady Nelson that brought the first settlers to Tasmannia in 1804, you can have an experience sailing a fully rigged tall ship like they did 100 years ago but with all the safety and comfort of a modern ship.